We are a fully self-contained mobile detailing service that conveniently performs high quality detailing on-site at your location. Whether you have a classic car, custom foreign sports car or a 1995 Camry, Auto Spa Express Detailing has the expertise to make your car look its best. With decades of experience, chances are we have worked on your type of vehicle. We are passionate about making your vehicle look its best and helping you select the best level of service and protection for your vehicle. As Auto Spa Express Detailing's Lead Detailer, Gabriel manages the day-to-day operations of the shop and oversees quality control. Gabriel loves working with clients and discussing their goals for their vehicle and the pros and cons of different products. We offer a variety of complete detailing packages to fit your needs. Choose from our Basic, Total and Premium Packages to restore your vehicle to "like-new condition". Our Interior and Exterior Packages are perfect for you and will get your vehicle back looking like new. Need a wash or vacuum? You can add one one for just a few dollars more. Give your vehicle an extra layer of protection with your choice of exterior waxes, sealants and ceramic coatings. Thank you for visiting the Auto Spa Express. We are a full service automotive mobile detailing company catering to a very discriminating clientele. Our clients expect only the best service and products. Our services are geared towards providing our clients with results that will continuously exceed their expectations. Automobiles are one of the finest pieces of art on the planet. We consider ourselves to be artists in transforming your vehicle to like new condition. We take great care and responsibility in providing your car with services that will add value to your vehicle. No need to sit around in a waiting room or arrange to be dropped off and picked up, we come to you! Our complete outfitted mobile detailing units are equipped with everything we need to restore your vehicle. Our mobile units can provide all services from a basic car wash to complete interior shampoo along with waxing, polishing, buffing, as well as a host of other services. What separates us from our competition is our love for what we do. For me personally, this isn't just a job or another business, this is my passion. There is a tremendous amount of personal satisfaction from turning a drab unsightly vehicle into a thing of beauty. We take great pride in seeing the end result of our work. We always try to meet or exceed the expectations of our clients. We never leave an appointment until our customers are satisfied with the work we have completed. 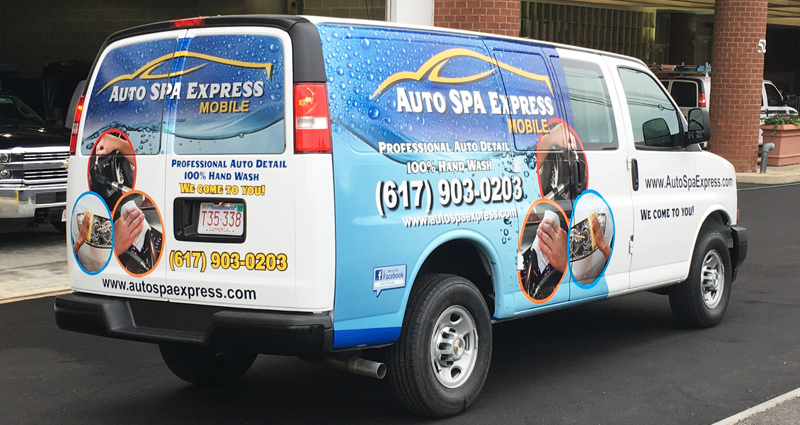 I hope that you will consider the Auto Spa Express for all of your automotive detailing needs. Does your business have multiple vehicles? Keep your fleet clean and running smoothly with our House Account program. The details of each House Account are determined on a case by case basis. Give us a call to ask about this program.